There’s been a lot of talk in the digital marketing world recently about the relevancy of blogs. 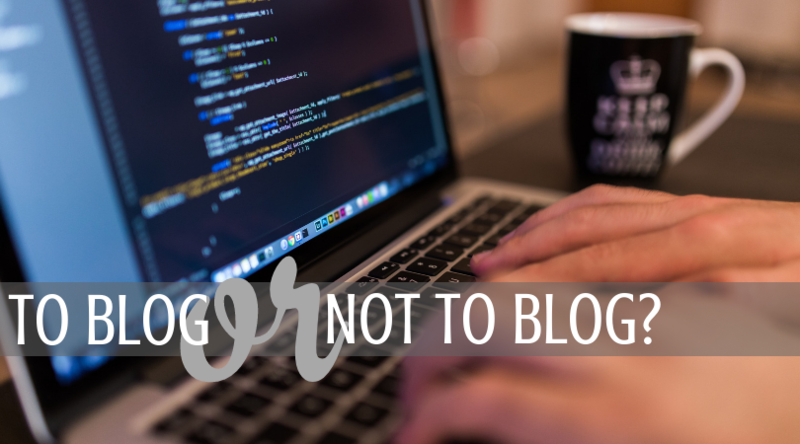 Does blogging still matter? Can it really help social media marketing? Do blogs still contribute to search rankings? Can they compete with new content like videos? The answer is a big enthusiastic YES! It’s true that video content has become the main focus for many companies, especially on social media, but blogs still carry a lot of weight when it comes to a solid content strategy. Whether you’re a big company or a small business just starting out, blogging should be at the top of your marketing strategy for 2019. Need more convincing? Here are 4 reasons to up your blogging game in the new year. Blogging remains one of the most effective strategies for driving traffic to your website. When done correctly and with purpose, your blog page is the perfect landing spot for your social networks. Your customers and clients follow your social pages because they love you and your products – use blogging as a means to share relevant information and updates about the things they love. Sharing a link with a quality image on your Facebook page will lead your followers to your website, and interesting content and inbound links (hyperlinks that bring users to other pages of your site) will give your customers a reason to stay awhile and explore. In today’s world, blogs and social walk hand-in-hand, and blog posts often drive social media strategy. Fun fact: According to Hubspot, 75% of users never scroll past the first page of search results. Your customers and clients want to know actual humans operate your business. Blogging is where you get to show personality and let people know what you’re really about. Blogs help create trust with your users, allow you to address questions and concerns, make your brand likeable, and give you a platform to show people how you’re different than your competitors. Give your readers valuable information that helps them in some way, and they will keep coming back for more. Social media is great for interacting with potential customers, but you can be social right from your blog. When you enable comments on your blog posts, you are giving your readers a chance to share their thoughts and opinions. Not every comment is going to be positive, but your response to constructive (or even negative) feedback says a lot about your company. End your blog posts with questions to encourage readers to discuss in the comments, or ask them to share a post if they really like it. Like social media, blog posts give you a plethora of opportunities to build relationships with those who follow your brand. Need help with your blog? Not sure where to start? Don’t have time for consistent updates? Blindspot can help! Contact us today to learn more about our blogging services and how we can help increase your website traffic.